Well, it could be the hottest day today and guess who is going to be standing (or sitting) around all afternoon at a Garden Party ~ I had better dig out the sunscreen! 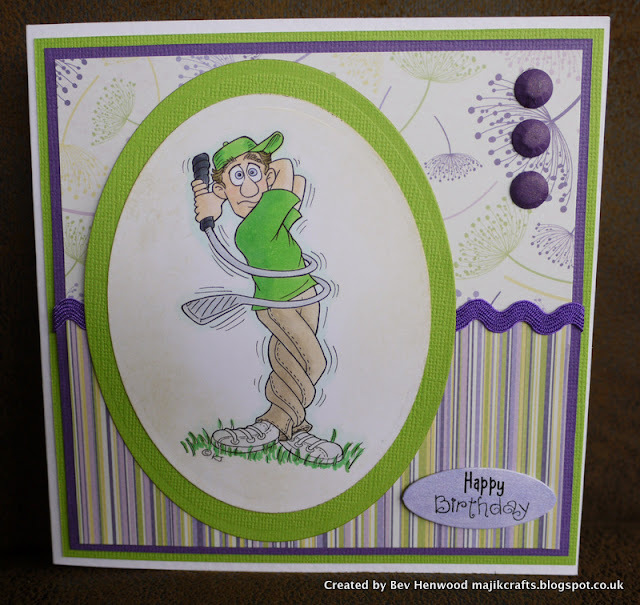 My share for today is a card I have made for the Copic Marker Europe competition to celebrate their 1st birthday online. The image is one I had to apply for and the condition of getting it (and another one) free was that you enter the competition ~ the closing date for submissions is today, so I've only just done it in time! The image is Krista Smith of Saturated Canary and called 'Travelling Colours' ~ isn't it gorgeous ~ I absolutely adore Saturated Canary images and this one is so cute. She is coloured with Copic markers and I have distressed the image with Tim Holtz "Tumbled Glass' distress ink as the white card was too stark against the coloured background. For the card base I have used one of my cut down hammered white card blanks and added a mat in purple card, the background papers are from the First Edition 'Dreamcatcher' paper pad and are adorable, both the image and the small contrasting piece of paper are mounted onto the same purple card. 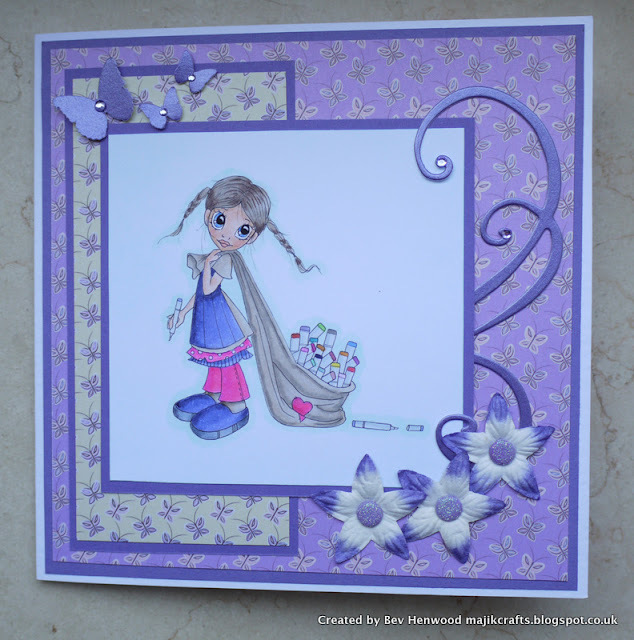 The flourish is cut from purple pearlescent card using a Magnolia Doohickey die called 'Leaf & Swirl' and the flowers are paper flowers from my stash (sorry no name or branding on the packaging) fastened to the card base with Doodlebug sugar coated brads in lilac. To finish I have punched three Butterflies from the same pearlescent card with a Martha Stewart 3 in 1 Butterfly punch and added lilac rhinestones. I thoroughly enjoyed colouring this image in and hope you all like it. Thanks for stopping by and I hope you all have a great day. Well, what wonderful weather we have been having here in Warwickshire ~ I have finally managed to get some serious gardening done ~ instead of pottering around in the greenhouse. Today I would like to share a card I made for my Step Brother who lives in Southern Ireland and enjoys the odd round of golf. I have printed out the image which is a digi image from Karen's Doodles called 'What A Swing' and coloured it in with my copics, I then ran it through my die cutting machine with a Nestabillities oval die (I don't know why, but every time I use this image it always ends up in a oval shape ~ it just seems to suit it somehow), I have then mounted the image onto a piece of Bazzil Basics lime green card also cut with a slightly larger oval die. For the base card I have used one of my cut down hammered white card blanks and layered with the same lime green card stock and some purple Bazzil Basics card stock, I then used two pieces of patterned paper from the Kaisercraft 'Lilac Avenue' Collection and hid the join with a piece of purple self adhesive ric rac, which I thought was more manly than ribbon! 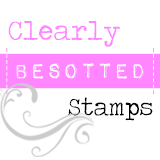 I added a sentiment from Craftwork Cards 'Messages' pack which was coloured with a copic marker and to finish added three Craftwork Cards 'Candi' dots. When it was all assembled I thought the image was a little too white, so I distressed the edges with a Tim Holtz Distress Ink Pad in 'Old Paper' to tone it down. I hope you all like it and thank you so much for visiting me today. Two posts in two days ~ what is going on? As promised I am back to share my new storage with you all. As mentioned in my previous post, most of my crafty stash lost its home in the house renovations, so when I find something that seems like it was almost made for storing a particular item I do a 'happy' dance ~ lol. So, 'drum roll' here it is. Apologies for the picture, these grey days are no good for good photos. 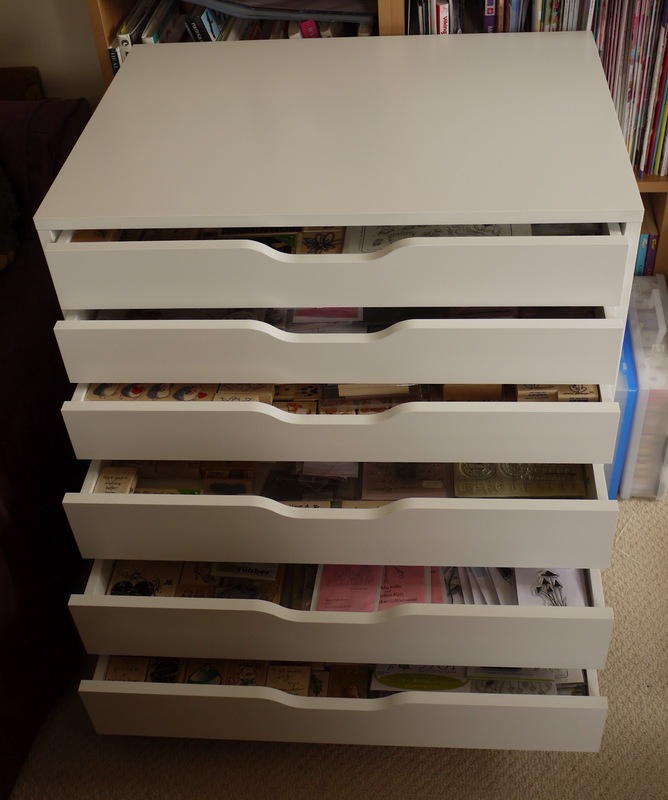 This is my new stamp storage set of drawers. It is from Ikea and called 'Alex', I don't name all my furniture, but Ikea give names to everything. I am so chuffed with this, it comes in white or black and came flat packed (as most Ikea stuff does) but was real easy to put together, DH did most of the work, with me supervising! Each drawer holds at least two layers of stamps and even I haven't managed to fill them all up in one go ~ need to buy some more then! Well that's it for today, except to say that it hasn't stopped raining since I got up this morning and I was forced to take three very shaggy dogs out in the rain ~ well what a picture the four of us must have looked by the time we got back home ~ my trouser bottoms were dripping on the floor! Thanks for stopping by and I hope you all have a great weekend. 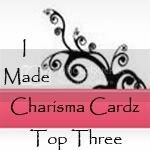 It is me the elusive blogger ~ busy busy again. After all the work we had done on the house last year (and some this year) I have struggled to get everything straight again ~ I do like things straight! There is a lot of finishing off to do and a lot of things seem to have lost their homes and keep re-appearing around the house. DH loves this because all of a sudden there is something where there wasn't something before and rather than look where he is going he trips over it (no matter how big the item is) and swears a lot! His two biggest bug bears are my cardboard box mountain ~ literally ~ in the workshop and my eBay mountain ~ again literally ~ on the landing, of course the two go hand in hand, I sell stuff on eBay and need boxes to send it out, he doesn't quite see this train of thought! I have been busy organising another sale on eBay and trying to sort out my craft room. A lot of my craft stuff lost its home in the work ~ I have been having a major sort out (hence the eBay sale) and re-organising the way everything is stored. I will be posting my latest storage solution on here tomorrow ~ just because I am so excited about it ~ lol. Anyhoo, enough of all that. My share today is a card that I made for a friend who now lives in Spain. 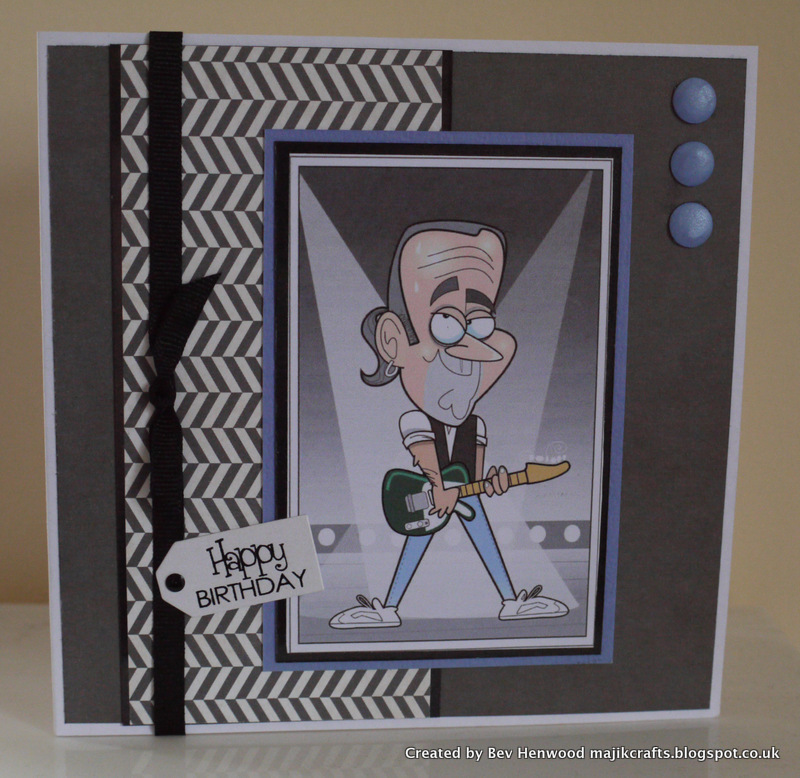 He is mad about Status Quo and I was thrilled to find this image for free on the tinter web. For this card I used one of my famous cut down hammered white card blanks, the background papers are from the Echo Park 'Yours Truly' paper pad. I have mounted 'Francis' onto a piece of metallic grey glossy card stock and then again onto a piece of blue Bazzil Basics card stock, I was trying to pick out the colour of his denims. To finish I have added a black grosgrain ribbon, three blue Craftwork Cards 'Candi' dots and a sentiment also from Craftwork Cards which has a Josy Rose nail head attached to it, so it looks like a brad. I do hope you all like it. I'll be back tomorrow with my storage photo.